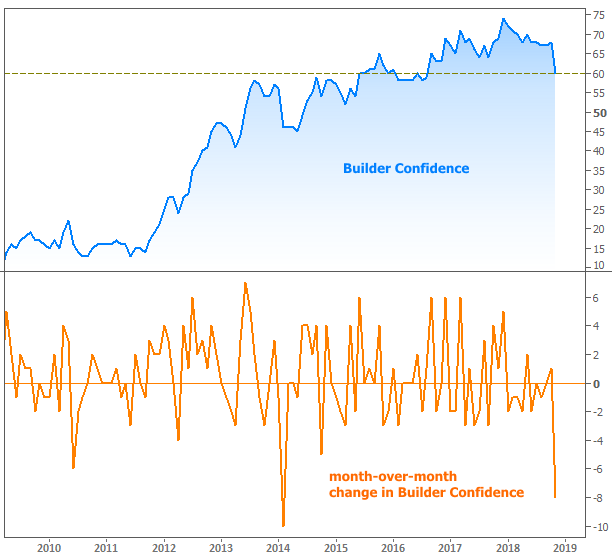 Builder confidence took a steep dive this month, reflecting increasing news of slowing home sales and rising concerns over affordability. The National Association of Home Builders (NAHB) said its Housing Market Index (HMI), a joint project of NAHB and Wells Fargo, dropped eight points. The index, which has been floating in the 67 to 70 range since March, had a November level of 60, the lowest since July 2016. NAHB Chairman Randy Noel said, "Builders report that they continue to see signs of consumer demand for new homes but that customers are taking a pause due to concerns over rising interest rates and home prices." With the prospect of future interest rate hikes in store, Dietz said that builders have adopted a more cautious approach to market conditions and urged policymakers to take note. "Recent policy statements on economic conditions have lacked commentary on housing, even as housing affordability has hit a 10-year low," said Dietz. "Given that housing leads the economy, policymakers need to focus more on residential market conditions." NAHB conducts a monthly survey among its new home builder members which asks them to express their perceptions of current single-family home sales and their expectations for those sales over the next six months as "good," "fair" or "poor." Builders are also asked to rate traffic of prospective buyers as "high to very high," "average" or "low to very low." Scores for each component are then used to calculate a seasonally adjusted index where any number over 50 indicates that more builders view conditions as good than poor. NAHB stressed that, despite the sharp drop, the survey's outcome remains in positive territory. Regional results are presented as three-month moving averages. The Northeast rose two points to 58. The Midwest edged one point lower to 57, the South declined two points to 68 and the West dropped three points to 71.